beverage service is in making your event memorable. Our Executive Chef's passion for food and years of extraordinary experience along with a culinary staff who take great pride in developing unique menus and beautiful presentations, all come together to create the perfect dining experience for each and every event. They will help you create the perfect menu for a memorable meeting, conference, ceremony, shareholders meeting, workshop, product launch, celebration, theme party, and much more! You may choose from a variety of tempting options from casual to elegant. 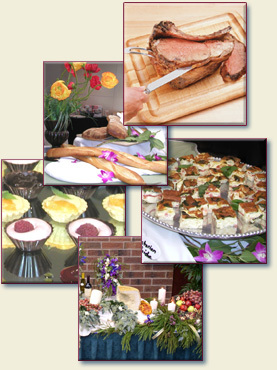 We offer classic American dishes to more highly-specialized regional choices as well as extensive a la carte selections, hot and cold hors d'oeuvres, buffet dinners and table side dining are available to help set the perfect tone for your event. Outdoor picnics and barbecues can also be arranged to create a fun, informal atmosphere. Whatever your choice -- each menu is distinguished by the dazzling presentation, the use of only the best farm fresh foods, high-quality products, and an emphasis on healthy - and tasty - choices.